The entrepreneurial bug is catching a growing number of Indian professionals despite the absence of a very favourable start-up ecosystem in the country. With a rank of 74 out of 79 nations covered, India fares poorly in the Global Entrepreneurship and Development Index 2012, prepared by the Center for Entrepreneurship and Public Policy, George Mason University, Virginia, US. However, it does better on innovation with a rank of 64 out of 141 in the Global Innovation Index 2012, released by Insead (an international business school) and the World Intellectual Property Organization. With its low entry barrier, Web is the preferred ground for the new breed of entrepreneurs. Goonjan Mall, 24, was working with consulting firm Bain and Co when he discovered an opportunity in making prasad available through an e-commerce website. 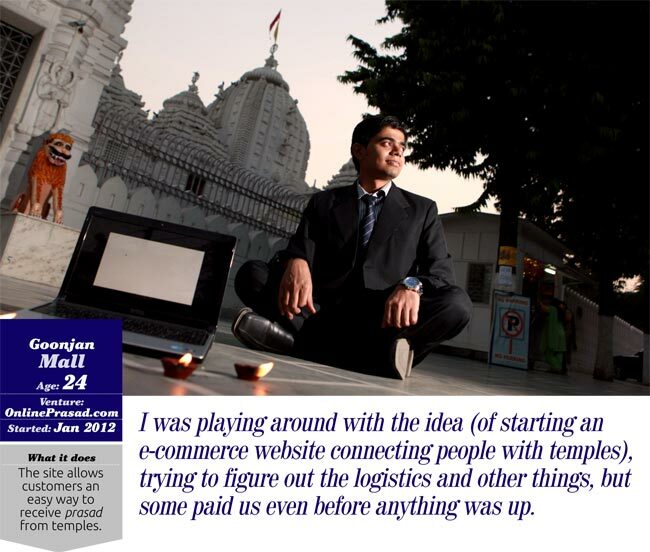 Mall, who graduated from Birla Institute of Technology and Science, Pilani, as an engineer in 2010, was visiting a temple in Rajasthan in 2011 when the idea of starting OnlinePrasad.com struck him. "It is difficult to visit far-off temples due to constraints of time and distance. We cannot bring the temple to the devotee, but we can do the next best thing. We can deliver prasad to help him stay connected with his faith," says Mall. Mall first looked at the viability of the idea. He talked to his father and had discussions with friends at Startup Leadership Program, a network and training module for entrepreneurs, and started calling up prospective customers. Mall got his first customer while the venture was still at the idea stage. "To be honest, it just happened. I was playing around with the idea, trying to figure out the logistics and other things, but some paid us even before anything was up," he says. Mall invested Rs 1 lakh and had the site up and running. The initial cost was low as the website used an online service to create and run the service. Web services such as BuildABazaar.com, Zepo.in and Shopify.com allow you to run an online store starting from Rs 500 a month. If you want to test an idea, you can use their free-trial offers. In January 2012, Mall delivered prasad to his first set of customers. He quit his job after a successful trial run and encouraging feedback. "In some time, we started getting repeat orders and enquiries about more temples. The numbers made sense for us," he says. The site is attracting more and more customers, having expanded to the country's most-visited temples. Mall doesn't want to disclose the site's financial performance. Serendipity is behind many great discoveries as well as start-ups. Hemant Kshirsagar, 26, got his idea while talking to his friend's mother. Kshirsagar started working as an information technology (IT) project manager with a private insurance company after graduating in electronics and getting an MBA degree. However, he wanted to get out of the 'corporate grind'. From this desire rose an IT solutions firm focusing on small- and mid-sized companies, which paved the way for his latest company that he set up with a friend in January 2012. He quit his job in May 2012. Then the two went looking for an idea. The advice came from a friend's mother, who wanted help to manage her yoga classes and expand her business. The two realised that yoga was catching on and the market had plenty of instructors, their potential customers. "The online search market was shifting from global to local and we expected a shift to local niche-based search. So, we decided to build a site where yoga instructors could put their profiles and details of classes to attract new clients," says Kshirsagar. Following the 'software as a service' model, they decided to create a yoga studio management software and bundle it with a listing website-YogaGuruji.com. The application was created with an investment of Rs 7 lakh, which came from personal savings, friends, family members and the parent company. The service was launched commercially in June 2012 along with the option of providing leads (prospective clients). The site faced it first challenge soon after it hit the market. Most instructors were keen on leads rather than the application. "We decided to provide leads without any fee to generate interest among instructors. We could then start pitching the software to them. It's an educate-and-sell market," says Kshirsagar. "Till now, the plan is working well. Our thinking is that with an increase in the size of our customers' pie, ours will grow by itself," he says. 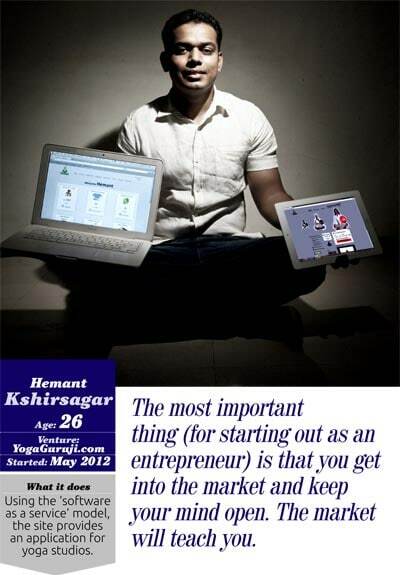 YogaGuruji.com operates in Mumbai and generates Rs 78,000 per year. The figure may not sweep you off your feet, but the future may be different. The website plans to soon cover Delhi and Pune and then expand to other metros. "We also plan to launch the online yoga studio management software internationally," says Kshirsagar. Being a copycat is frowned upon by most people. However, taking a business model and tweaking it to meet your needs isn't such a bad idea. 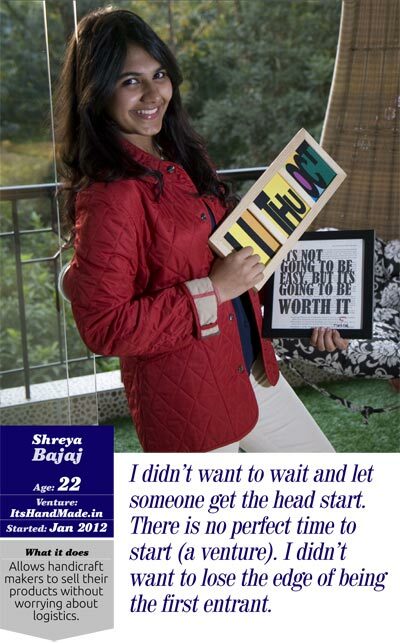 Inspired by Etsy.com, a USbased marketplace for handmade stuff, Shreya Bajaj started ItsHandMade.in to cater to the Indian market. Bajaj, a 22-year-old student of chartered accountancy, came up with the idea a year ago. With an investment of Rs 5 lakh from parents and a six-month gestation period, the site started its trial run in January. Bajaj has modified Etsy.com's business model to suit the local ecosystem. Artisans can list their products on the website free of cost and specify the delivery schedule. When a buyer places an order, the site handles payment processing and alerts the seller. It also handles shipping through a logistics partner. It charges a commission of 15% of sales apart from the shipping cost. In contrast, Etsy.com charges a listing fee and does not provide any logistics support. "Initially, only sellers could join. It was for testing the user interface and ensuring that everything worked properly," says Bajaj. In February, the online marketplace became fully operational. It gets 15-20 orders a day with average order volume being Rs 1 lakh per month. In a model sourced from another market, the advantage is in taking the lead. "I didn't want to wait and let someone else get the head start. There is no perfect time to start. I didn't want to lose the edge of being the first entrant," she says, explaining her decision to start while still being a student. Bajaj says her e-commerce platform is about to break even. She plans to go international by December 2012. If you are inspired enough, you, too, can come up with an idea. Look around your surroundings. Can you find a problem? Is there any segment of people looking for a service? "Any venture with the objective of solving a problem can be turned into a business," says Kshirsagar. "We started out looking for a problem we can solve. The next stage was building a revenue model around it," he adds. "The most important thing is that you get into the market and keep your mind open. The market will teach you," says Kshirsagar. When you come across an idea, how do you know it can be turned into a great business opportunity? Kshirsagar suggests a three-step check: Are you going to solve a problem for someone? If yes, will he pay for it? Finally, what are the numbers you can clock? To check consumer interest, you can put a 'coming soon' webpage before your target audience. Such a page invites comments, suggestions and pre-launch orders. Being lean is recommended. Mall of OnlinePrasad.com suggests reading authors such as Steve Blank and Eric Ries to understand the concept of a lean start-up. Don't keep waiting for the ideal moment. "You will always have doubts. You have to take the risk and give it a try," says Bajaj.